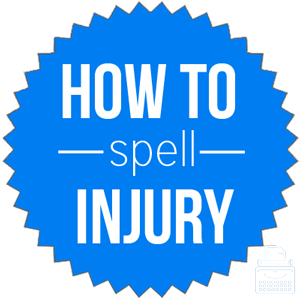 Spelling of Injury: Injury is spelled i-n-j-u-r-y. Definition of Injury: An injury is some sort of damage or harm done or suffered by a person or thing. In law, an injury is a violation of another’s rights for which legal action to recover damages or losses is allowed. Pronunciation of Injury: Injury is pronounced in-jer-ee. What does injury mean? Injury is a noun. It is the damaging or hurtful result of an action. An inury may refer to a specific type of damage, loss, or hurt—such as a broken leg or sprained ankle. It is also used in law to refer to the violation of someone else’s rights for which legal redress is allowable. He sustained a leg injury from his fall in the football match today. The injury to my client by the defendant is clear and has been catastrophic in his life and business affairs. Add insult to injury: to say or do something that worsens an already bad situation or injury for someone. The boss demanded that all employees work overtime, and to add insult to injury, there would be no overtime pay. Do oneself an injury: to hurt oneself or become injured by one’s own actions. According to Merriam-Webster’s, the first known use of injury was in the 14th century. The word comes from Middle English, injurie, from Anglo-French, and originally from the Latin word, iniuria, meaning a wrong, injustice, which is the feminine form of iniurius, meaning unjust. The original Latin word was formed by adding the prefix “in-”, not, to ius, iur-, law. The primary definition of injury—damage or harm caused to someone or something—has a few synonyms that can be substituted. In terms of the legal definition, the following synonyms may be used to replace injury. Injury is a noun that refers either to the damage or harm done or suffered by a person or animal or to the legal term meaning loss, damage, or suffering caused by another unjustly and for which legal repercussions are available.